Hail Mary Prayer: Hail Mary, full of grace. The Lord is with thee. Blessed art thou amongst women, and blessed is the fruit of thy womb, Jesus. 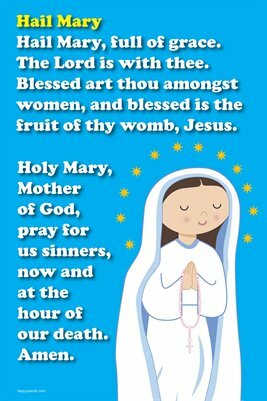 The Hail Mary Prayer 12 inch x 18 inch poster features a favorite traditional Catholic prayer with Happy Saints artwork that the family will enjoy. Great for home, church and school. Visit www.happysaints.com for more resources.